I have written before about going to academic conferences and finding my tribe. 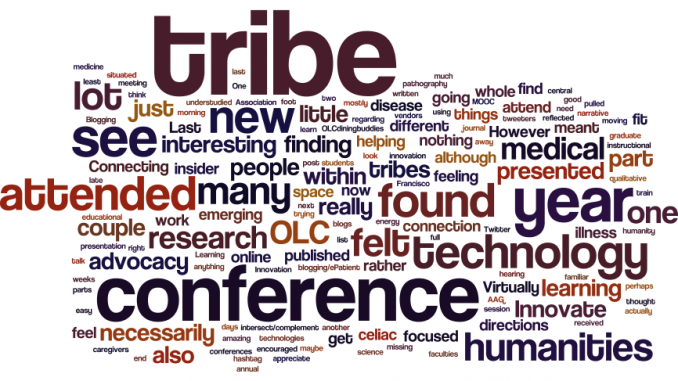 For a while I had found my tribe – in the Educational Technology world. I felt that it was where I belonged. I teach emerging technology and instructional design. I love online learning – helping my students learn what a good online graduate course can be, and helping them experience transformational learning. It is very rewarding, and I very much look forward to doing more of it. However, I’m finding that the educational technology tribe is missing part of who I am. I have a foot in it, but there are whole other parts of who I am that are not reflected in that tribe. My research is moving a little away from emerging technology, and into pathography (illness narrative). It is still technology focused, but it is more about how people are using the technology, not about the technology itself. Blogging is nothing new. But the use of blogs to help patients and caregivers experiencing critical illness is an understudied phenomenon. Last week I attended the OLC Innovate conference. This was the successor to what used to be the OLC Emerging Technologies in Online Learning Conference. Last year I attended and felt that I had found my tribe. I was an insider at that conference. This year I felt that I had found a tribe, but we were a little more on the fringe. I was not the “insider” that I was last year. The conference did not have the same feeling of being where my tribe was. In part, I found that a lot of what was being presented was nothing new. I found that I’m hearing the same presentations year after year (this is the third year I’ve attended the conference). I didn’t really see a lot of Innovation at OLC Innovate. It kind of felt repetitive. Perhaps it is just that I’m so aware of the field? Or perhaps it is just that the conference is a little more practitioner focused? Or maybe it was that the structure of the conference didn’t work as well? The new location meant that there was no central space – so although I knew a lot of people presenting, I didn’t actually see many of them. Also the keynotes were late in the day, so I wasn’t motivated to get up early and attend the first session in the morning. It meant I attended less of the conference. I tried to talk to vendors, and had a few interesting conversations, but again, didn’t really see a lot of innovation. I was familiar with most of the technologies that I saw. I met a few new people, mostly through Virtually Connecting and twitter. The #OLCdiningbuddies hashtag was effective for ensuring that our dinner tables were always full. Twitter itself felt rather quite this year. I was #6 on the list of top tweeters, and I feel like I barely said anything. In the end, I don’t see myself payout out of pocket to attend OLC Innovate next year. I will put my energy elsewhere. A couple weeks ago I attended and presented at the medical humanities stream of the Association of American Geographers (AAG) annual meeting. The conference was in San Francisco so travel was easy (I could commute to the conference by train for the two days that I attended). One of the things I learned was that geographers do a lot more than I thought! I also made a couple of new connection, and one specific connection regarding some potential advocacy and research work relating to celiac disease. I found all the presentation to be interesting. They were fresh new ideas for me. I am also encouraged to see space within faculties of medicine for none MD (medical doctor) academics. However, education doesn’t really fit within the humanities. Education is technically a social science rather than a humanity, but many of our qualitative research methods are influenced by the humanities. So although I was interested in everything presented, it wasn’t necessarily a “fit” with what I do. We’ll see. I have at least one paper in the works that I’m going to try to get published in a medical humanities journal. It will be interesting to see how it is received. I’m finding that I have different tribes – and each pulling me in different directions. I have the Virtually Connecting tribe which is doing some amazing things with hybrid conference participation, the #rhizo MOOC tribe which just recently published a couple of articles, the breast cancer blogging/ePatient advocacy tribe where my PhD research is situated, the celiac disease advocacy tribe, and now I’m also trying to find a home within the medical humanities tribe. It is no wonder that I am feeling pulled in so many directions right now. I think my big ‘learning’ from this post is that I should not expect one tribe to necessarily understand or appreciate the other tribe. Each tribe has its own value, but they don’t necessarily intersect. I need to be part of many tribes to feel whole. How many tribes do you have? Do you find that they intersect/complement one another? Well i like the question at the end! I have always had multiple tribes, as far back as i can remember. For me, DigPedCairo was a huge intersection of my tribes. The f2f AUC, the other Egyptians attending. The DigPed folks. The VC people. The AMICAL ppl. It was nuts. I like both keeping my tribes separate AND merging them when it makes sense for a temp purpose. Tell u sthg funny. I was organizing apartment-mates when folks were here and telling the AMICAL director i was trying to put folks together who would culturally fit well. He joked that he would only accept Japanese-American-French ppl w him. He was demonstrating that if we overfocus on these dimensions we limit ourselves i think and that we are all also unique anyway. So. What i am saying is. I don’t think u need to find a tribe or even one friend who shares all that u r. A cancer blogger instructional technologist biker Canadian married w no kids who lives in California and attends Unitarian church.